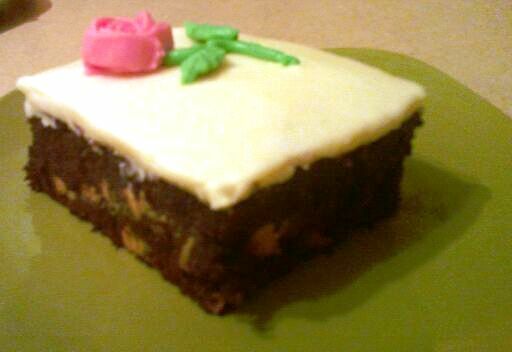 Peanut butter fudge brownie with butter cream icing. Makes approximately 3 cups icing. Note: The confectioners sugar must be sifted. The measurement will be off if you do not sift the sugar before measuring. Also there may be tiny bead sized lumps in your icing if the sugar has not been sifted. Simply put this is not a time to take a short cut if you expect smooth icing. When making your icing it will form a crust quickly that is what the damp cloth will prevent. When I decorate my cakes I fill the decorator bags and immediately cover the remaining icing so it will not crust over. I have also used plastic wrap placed directly on top of the icing this is my favorite way to prevent a crust from forming. This icing will be soft and easy to spread. This icing is generally good for writing, some trim, and small flat flowers. This icing is not usually stiff enough for roses and other detailed flowers. Next tip, I will share a good stiff icing recipe great for roses and other decorations. Yum... that cake looks good enough to eat right off my computer screen. Good Job!! This icing is specifically for special occasion cakes. Such as wedding cakes. The vegetable shortening enables the decorator to get a flawless look. There are alternative recipes that one can use however, it is difficult to get a professional look when using these recipes. Yummy and even Abby agrees!!! I'm going to attempt a cake this weekend if Abby will be still long enough for me to give it a go. My daughter just made a cake for me to celebrate my getting my black belt in taekwondo. It was delicious!! I'm going to try this recipe on my birthday cake in a few weeks. :) thanks for it! !